The Chinese-American Planning Council (CPC) is grateful for the steps that Mayor de Blasio and the City Council have taken toward a fairer and more equitable city in their FY 2019 Adopted Budget. During challenging times, we urge both the Mayoral Administration and City Council to ensure that the Asian American community, immigrants, communities of color, and low-income New Yorkers, as well as the human service providers that champion them, receive a fair share of funding. While the City faced significant federal and state budget constraints, those very federal cuts make the social safety net all the more important for underserved communities. These programs are especially important to our young people, and we look forward to partnering with the City and our allies to support opportunities for the next generation of Asian Pacific American and immigrant New Yorkers in the upcoming year. Funding for community based early childhood teachers’ salary parity, who do the same jobs with the same qualifications as their DOE counterparts but earn significantly less. Urgent investments to the human services sector were not included in the FY 2019 New York City Budget. The human services workforce is one of the hardest working in the city and are often staffed by the very communities they serve. More often than not, human services contracts do not cover the full costs of services or are subject to significant delay, causing risk to the stability of important community organizations. 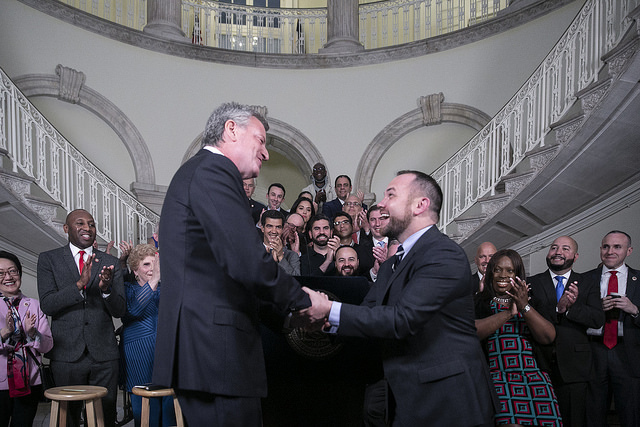 We look forward to continuing to work with the Mayor and City Council to ensure human services providers are appropriately resourced to advance New York City’s most underserved and marginalized communities. Founded in 1965, the Chinese-American Planning Council (CPC) mission is to promote social and economic empowerment of Chinese American, immigrant and low-income communities. We advance our communities through more than 50 programs, including childhood development services, education and career services, community services, and senior services. We serve over 60,000 community members across all 51 Council Districts in New York City each year. We transform our communities through social services and social change. In order to build transformative change, we have created a policy agenda that addresses persistent needs and emerging trends in our communities. $20.35 million in funding for middle school summer camp programs. $14.2 million to baseline 6,500 COMPASS Elementary slots. $12 million in funding for Adult Literacy programs. $5 million for the Communities of Color Nonprofit Stabilization Fund (NSF). $200 million in funding to address chronic underfunding in the nonprofit human services sector. $21.3 million to baseline 10,000 Summer Youth Employment Program positions and address a rising minimum wage. Funding for salary parity for early childhood teachers in community based organizations, who do the same jobs with the same qualifications as their DOE counterparts for vastly different pay. Funding for three City Council Initiatives which support older adults: Health Aging, Support Our Seniors and Naturally Occurring Retirement Communities. Funding for three City Council mental health initiatives: Geriatric Mental Health Initiative, Children Under Five Mental Health Initiative and Autism Awareness Initiative. Funding for Fair Fares to provide half-price MetroCards to New Yorkers living below the poverty line.